Thank you to all our entrants and congratulations to our winner, Arkin Tilt Architects! 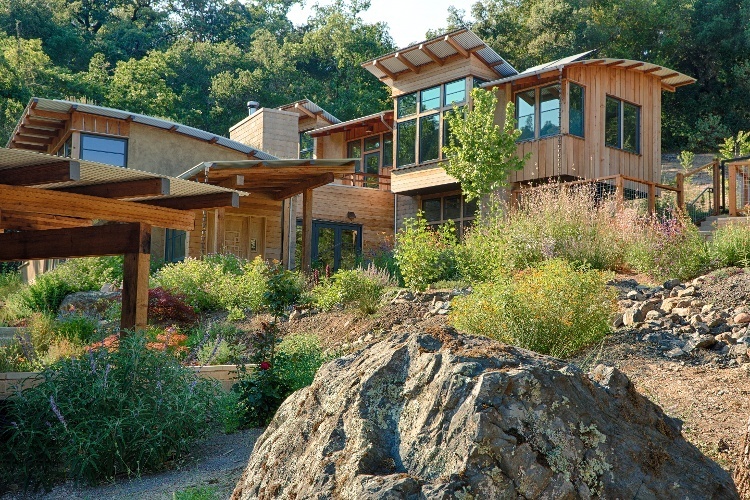 Nestled in a beautiful 170-acre property along Porter Creek in rural Sonoma County, the design and construction of this off-the-grid homestead take great measures to ensure a harmonious fit with minimal impact on both the specific and global landscape, providing a sustainable frame for living and raising twin daughters. The indoor/outdoor flow creates an enriching yet peaceful living space for the family and their deep appreciation of the natural world. This residence exemplifies innovative sustainable design with its hybrid use of materials and site sensitive building. 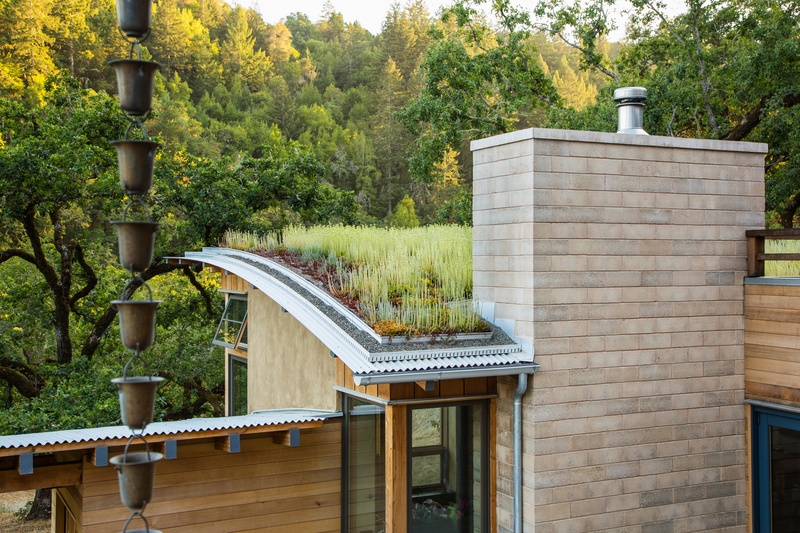 The property includes a living roof (that you can sleep on! ), straw bale walls, passive solar, and get this, no need for AC because of its siting, insulation and carefully planned shading. But what got us is the melding of sustainability and high design. 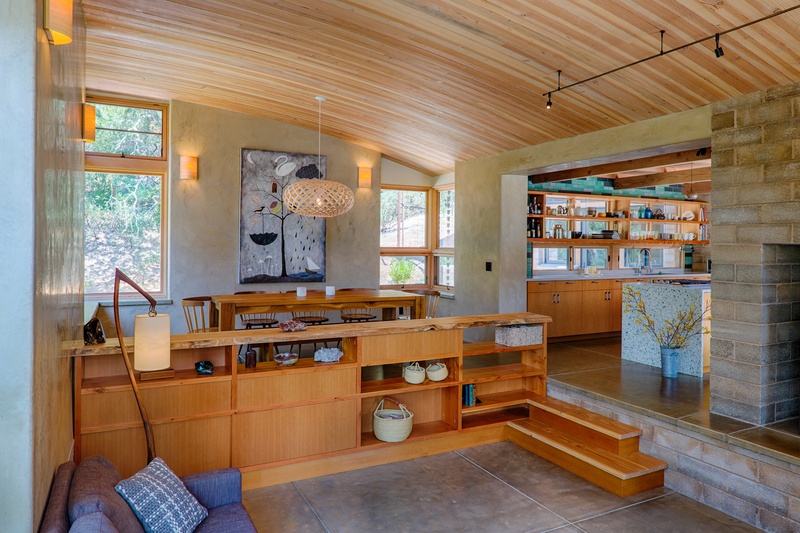 Not only is this home smart, energy efficient and low impact, it looks killer. Just like Vetrazzo recycled glass. 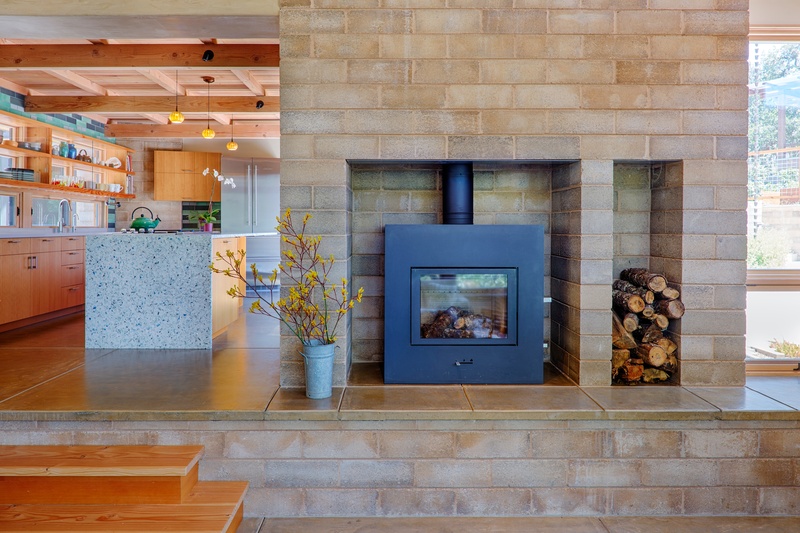 David Arkin, partner in the Berkeley, California based, firm spoke with us about the modern home that he and Anni Tilt designed, along with key associates Nadia Khan and Amanda Knowles. Here in the kitchen which opens up to the living room, a Vetrazzo recycled glass island in Palladian Grey provides ample workspace while neutral Caeserstone perimeter countertops provide a muted backdrop to the douglas fir custom cabinetry by Higgins Custom Cabinetry. Because of it's reliance on passive solar the home recieves abundant direct sunlight. 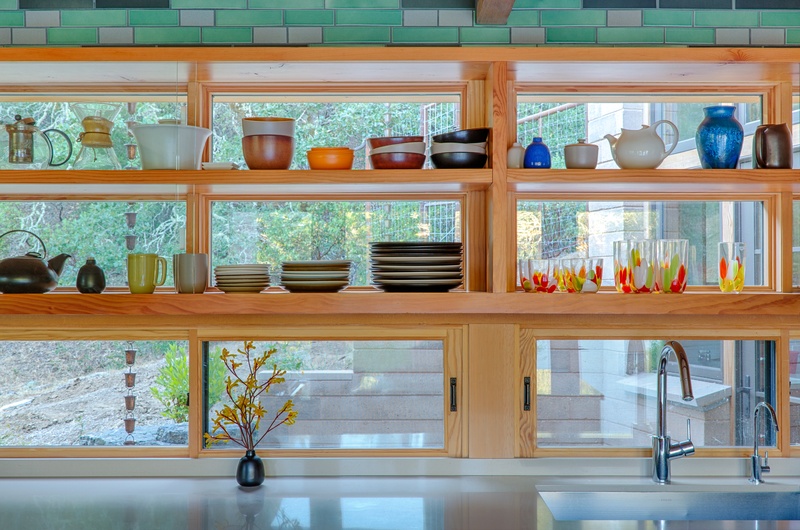 The windows above the sink countertop have shade fins and shelving to protect the quartz from the direct light which can fade or warp the surface. The wood for the ceiling beams, which provide structural support for the living roof, were milled on site and on a neigbhor's property. The tile from Sausalito tile maker Heath Ceramics pairs beautifully with the subtle green notes in the Palladian Gray crushed glass countertop. 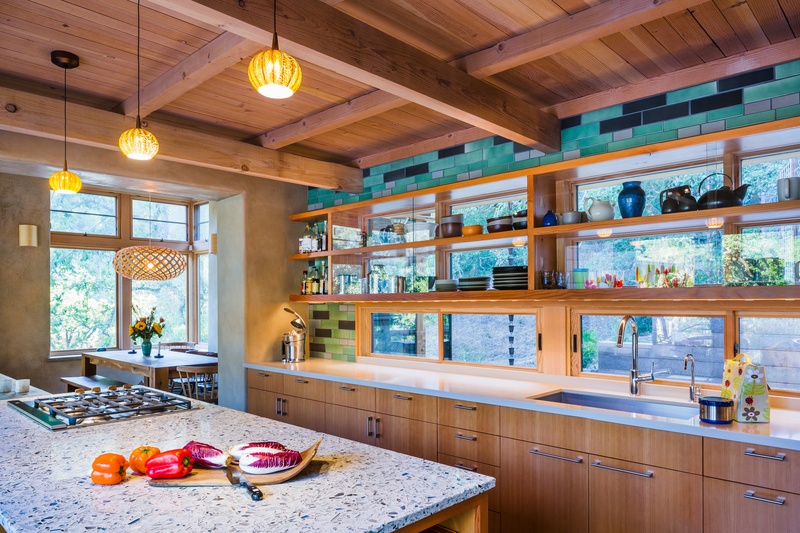 Intertile provided the Vetrazzo slab and the counter was fabricated by Green Valley Slabworks. Earth Tone Construction built the home where the local redwood and Douglas Fir were used throughout the house in cabinetry, furniture and ceilings. Though the style is modern the feel through each room is warm and welcoming. 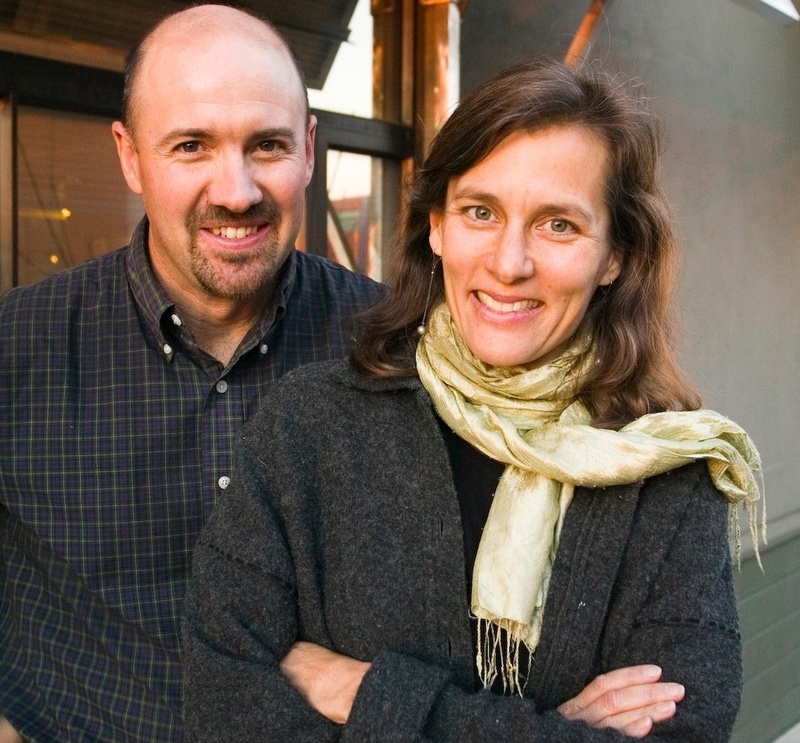 "By all accounts they absolutely love their house," Arkin said of the owners. Arkin said he and Tilt chose the waterfall design for the island to showcase the beautiful face of the Vetrazzo overlooking the living and dining spaces. "Vetrazzo allows clients to express their conservation with a very overtly recycled material." Use of Vetrazzo's recycled slabs and tiles provide LEED credits. The firm has built a name for itself in ecological planning and design, with projects in commercial, residential and even educational uses, most of which include Vetrazzo recycled glass counters as part of the designs.  "Vetrazzo is a win, win, win," Arkin said. "It's a beautiful, durable and recycled resource. Everything we believe in rolled up into a single material." Plus he said, "People really dig it." If you're a fabricator, designer or homeowner in the Bay Area looking to source Vetrazzo for a project, then contact local distributor Intertile for more information and to view slabs. 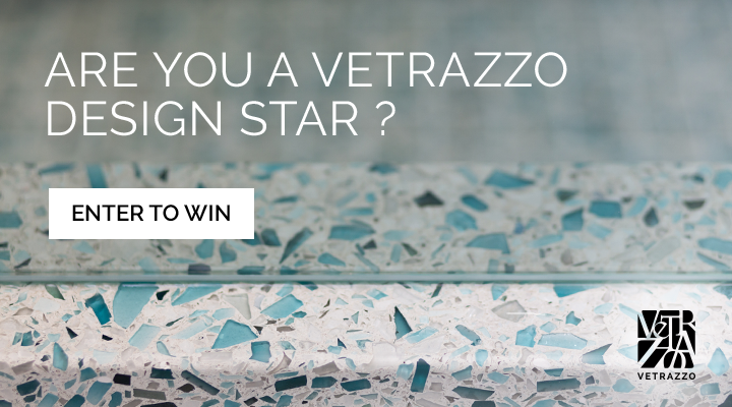 You could be our next Vetrazzo design star. Click here to learn more about how your design can be featured on our blog and social media.